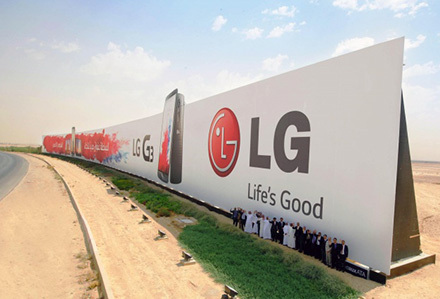 The structure in question, a billboard advertising the LG G3, is 240 meters wide and 12 meters high. In total, we’re looking at 3,000 square meters of pure G3 advertisement bliss. 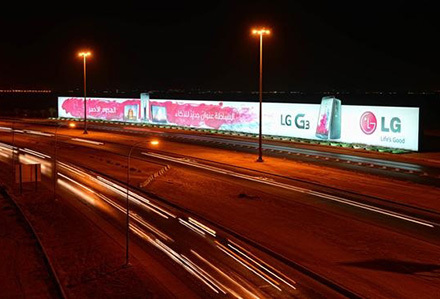 The billboard reportedly took 1,800 tons of steel to make, since LG had to design it in a way that would allow the billboard to withstand harsh winds and whipped up desert sands. The billboard is placed near the King Khalid International Airport, where around 20 million people per year fly in and out. Because of its tactical placement, LG expects the billboard to bring in an extra $25 million per year in revenue. Seeing how big the billboard is, that figure might not come across as a surprise for many. 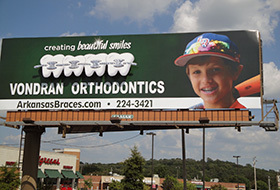 Thankfully, while the billboard currently advertises the G3, the company could plan to use the billboard for other products in the future. It’d certainly be a shame for a 3,000 square meter advertisement to only be able to promote the G3 in 2017, to say the least.